Bunnies need fresh water every day. You should always measure the feed because the first sign your bunny is sick is that he quits eating. Adding tea to the drinking water reduces the ammonia in the urine and helps reduce bacteria overgrowth. Very few bunnies ever die of old age! HAIRBALLS - rabbits need hay or straw as part of their weekly diet so help them pass the hair out of their system. Chewable papaya tablets or fresh papaya and fresh pineapple help as well. A rabbit that quits eating probably is developing a hairball. ALWAYS CONSIDER IT AN EMERGENCY WHEN YOUR RABBIT QUITS EATING! Delay can cost your bunny it's life! DIARRHEA - abrupt changes in feed or greens fed to young rabbits can lead to diarrhea, dehydration and death. NEVER FEED LETTUCE! If rabbits show any signs of diarrhea, remove all green pellets and feed old fashioned Quaker Oatmeal or dry bread. Willow leaves and mint will also help stop the diarrhea. ACCIDENT - rabbits don't always land on their feet when dropped like a cat. Broken backs are not uncommon injuries. Dislocated spines are treatable but fractures are not. HEAT STROKE - Rabbits don't sweat or pant. They can only exchange heat through the blood vessels in their ears and can become overheated and die very easily. Take a 2 litre plastic bottle filled with water that has been frozen overnight and put it in your rabbits' cage when the temperature reaches 80 degrees or hotter. It will drop the air temperature around the rabbit considerably. Keep an extra on hand to use while one is re-freezing. Attach a drip irrigation hose to the top edge of the hutch roof. The water running drown the back of the cage will act as a swamp cooler. You can attach a misting system near or over the cage. If you use a fan, direct the air OVER or UNDER the cage. NOT DIRECTLY ON THE RABBIT. Domestic rabbits are born naked, deaf and blind. 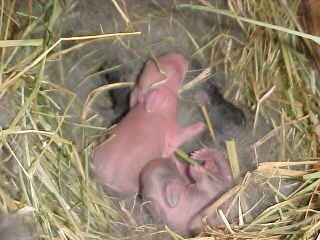 Jack rabbits are born fully furred and ready to run. Mothers only nurse the young once a day for the first two weeks. Rabbits have a very keen sense of smell and are usually sensitive to the smell of smoke, perfume and fabric softeners. Many are allergic to perfumes and dust. Although rabbits are very clean and seldom need a bath any flea shampoo or spray that is safe for kittens is safe for rabbits. But be sure to dry the fur completely so the bunny doesn't catch cold.